MUM is not currently accepting applications for this track. Email mfafilm@mum.edu for updates. At the beginning of the David Lynch Master of Fine Arts in Film program, you will be taking a fundamental course in Consciousness-BasedSM Education—the unique educational approach of Maharishi University of Management—called Science and Technology of Consciousness (STC). The goal of this course is for you to gain experience and understanding of consciousness as the unifying basis of all branches of knowledge. This course provides a foundation for all other courses you will take at the David Lynch MFA in film here at Maharishi University of Management. The course introduces you to key ideas and terms relevant to your studies and to your experience here. 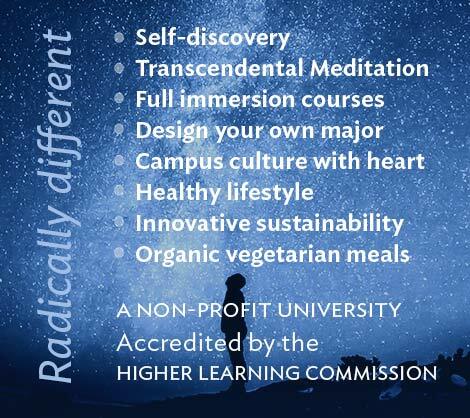 Our university is centered around the teachings of Maharishi Mahesh Yogi, the well-known founder of the TM technique. 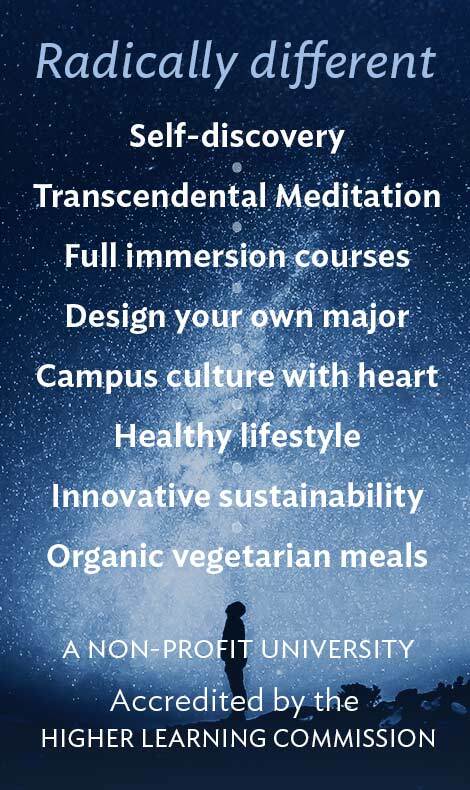 The practical aspect of STC is the Transcendental Meditation technique, a simple non-religious mental technique that produces positive effects on mental health, physical health, and social behaviors. More completely understand the relationship between your individual self and your universal Self—the field of pure inner wakefulness, unbounded pure consciousness, at the source of thought and the source of all creativity. Use principles of the Science of Creative Intelligence to deepen your understanding of foundational principles in the arts, sciences, and humanities storytelling, and filmmaking. Articulate how growth of consciousness and the study of inner subjectivity enrich education, your creative process, and other areas of life.